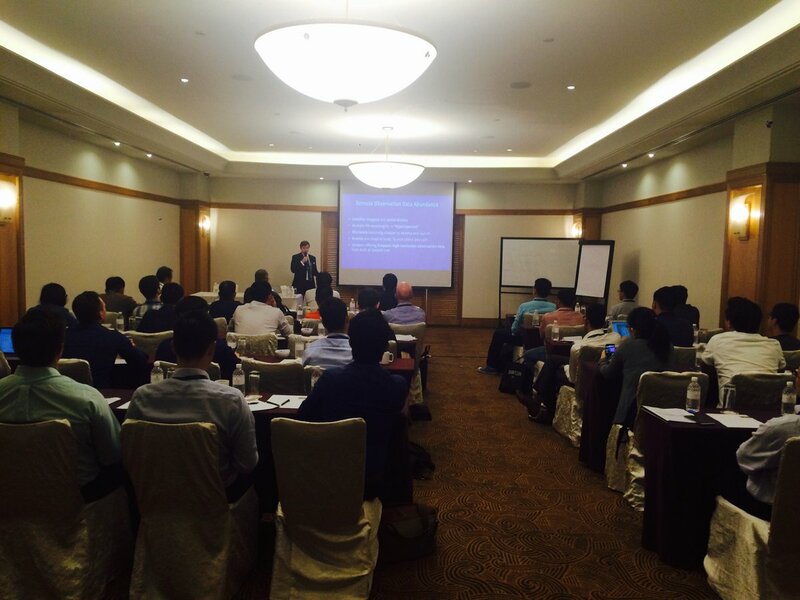 In November 2016 we flew out to Singapore to give a talk at the Quantopian Singapore QuantCon. The event was absolutely fantastic with an incredibly diverse and interesting set of talks. We gave a talk was on the topic of Hunting For Alpha In Alternative Data. Here is a brief summary of the trip. After the success of QuantCon NYC in April 2016, Quantopian decided to run a similar event in Singapore, one of Asia's largest financial hubs. There is a large retail quant trading base in China, Singapore and Australia that was well represented at the conference. It was great to put faces to names from the quant world and meet many quants whose work we have been following for some time. In particular we met Tom Starke, Aidan O'Mahony, Jonathan Larkin, Jess Stauth, Scott Treloar and Delaney Granizo-Mackenzie. It was also great to catch up with Andreas Clenow who we met at QuantCon NYC. He gave a fantastic keynote speech on the topic of counter-trend following, with some great insights into how the market for trend following has changed over the years. One of our favourite talks was given by Scott Treloar on the topic of Deep Learning in financial time series. Scott discussed that he was "betting on the GPU" rather than the "bank of monitors" common to many trading floors. We took that to mean he is backing Deep Learning as a potential "game changing" technology for quant finance in the next few years. In addition to the talks we also met many QuantStart readers. It was great to chat to many of you in person and discuss all things quant trading! We gave a talk on the topic of The Hunt For Alpha Among Alternative Data Sources. The goal of the talk was to emphasise that a large set of quant strategies are being carried out by quant funds, family offices and dedicated retail quants, that make heavy use of "alternative data sources". Such sources include satellite feeds, drone imaging data, email purchase receipts and social media feeds. In the talk we touched on the theme of "alpha decay". Information diffusion is now extremely prevalent due to the internet, open data and open source software, leading to a rapid dissemination of strategy ideas and implementations. Hence quants need to look at more "niche" data sources in order to keep generating alpha. Big areas of interest include industrial "Internet-of-Things" data, agricultural technology (AgTech), energy supply/demand data, weather data, geo-monitoring and sentiment analysis. However the "data deluge" requires new methods to quantify and analyse it, which is where techniques such as Machine Learning (and Deep Learning in particular) come in. The final part of the talk discussed "sketch" alternative data strategies based on oil supply/demand and weather derivatives, that could be tackled by a dedicated retail quant researcher/data scientist or a multi-talented small quant team. We'll be talking about these topics a lot more in 2017, as they are likely to form a large part of the quant landscape in the coming years. We'd like to thank John "Fawce" Fawcett and Kelly Elmstrom for kindly inviting us to the talk. As with QuantCon NYC, we had a great time meeting everyone!